Have you taken a peek out in the garden just recently? Have you spotted any robins perched on your fence or trees. We’ve had the perfect weather just recently for these little birds to make an appearance. Have your little ones had the opportunity to see one? If not, let them use their imagination when coloring in Day 7 of our free Christmas coloring pages. 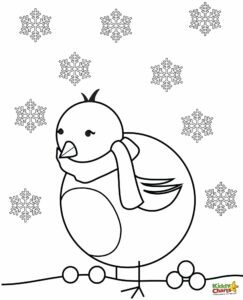 Our robin coloring pages are available from today. He will match in really well with the snowflakes that have already been available for download. If you’ve got any images of your little ones coloring in these downloads, we’d love to see them. Post them on our Facebook page or Tweet us a pic using the hashtag #kiddychartsadvent.